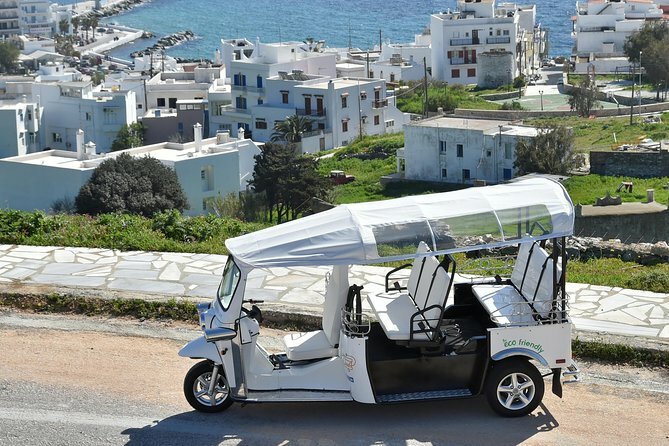 First time in Mykonos Island our ECO friendly, 100% Electric TUK TUK vehicles are at your service ! We are private and commuting with style. All our private tours are operated via Tuk Tuks, which are 100% electric tricycles that make it easy for everyone to enjoy a 360° city view. All the tours are booked privately for our customers, customers' family and friends. We respect our clients' individuality and privacy. We promise our foreign friends an exciting itinerary full of culture and lots of fun! So #enjoytheride with Comfort, Luxury & Style ! The Archaeological Museum of Mykonos is a museum, in Mykonos, in Greece. Its collections include exhibits dating from the Prehistoric to the Hellenistic period. Manto Mavrogenous (Greek: Μαντώ Μαυρογένους) (1796 – July 1848) was a Greek heroine of the Greek War of Independence. A rich woman, she spent all her fortune for the Hellenic cause. Under her encouragement, her European friends contributed money and guns to the revolution. The Agricultural Museum of Mykonos is an open-air site, although part of the display is housed in the Boni windmill, dating from the 16th century and belonging to the Folklore Museum of the island. The core of the Mykonian Agricultural Museum, the first open-air museum in Greece, is Boni's windmill. The Cyclades islands are among the windiest areas in the Mediterranean, particularly Mykonos, where the calm days number no more than ten during the whole year! The mykonian windmill is a heavy three-storey cylindrical stone stracture. The raised basement is used for gathering and weighting the weat. On the middle floor, the grain is gathered to be ground by the ancient grinding machine on the second floor. The windwheel usually consists of 12 wooden antennas with equal-in-number triangular sails. The windmills have been the most popular of all the sights of Mykonos and are recognised worldwide as a trademark of the island! The beneficial to the public institution "Mykonian Folklore Museum" is situated at Castro, in a 18th century building. There are exposed museum articles sorted by subject. Keys and locks collections, handwoven tapestries, painted plates, old weights and measures, traditional Cycladic sculptures and lighting devices ranging from the ancient oil to the kerosene lamp. Obsedian tools and weapons representing the interior of a 19th century middle class drawing room.19th century bedroom. A 19th century kitchen. Around the "Mermelechas well"- a known pirate there are large and small traditional Aegean ship models, cannons and pictures of old Mykonian sailing and steamships. Marathi is a beautiful Lake in Mykonos Island in the Cyclades Region of Greece. Mykonos Protected Landscape Area is one of the most green areas of Mykonos island. The Aegean Maritime Museum is a maritime museum in Mykonos, Greece. The founder and chairman of the museum, George M. Drakopoulos, received the Athens Academy Award and the World Ship Trust's Award for Individual Achievement for the foundation of the museum. The Mykonos windmills are iconic feature of the Greek island of the Mykonos. The island is one of the Cyclades islands, which neighbour Delos in the Aegean Sea. The windmills can be seen from every point of the village of Mykonos, the island's principal village, which is frequently called the Chora (which translates to "Country" in Greek, but refers to an island's "Town") on Greek islands. The windmills are the first thing seen when coming into the harbour of Alefkandra, as they stand on a hill overlooking the area. Most windmills face towards the North where the island's climate sources its strongest winds over the largest part of the year. There are currently 16 windmills on Mykonos of which seven are positioned on the landmark hill in Chora. Most of them were built by the Venetians in the 16th century, but their construction continued into the early 20th century. They were primarily used to mill wheat. They were an important source of income for the inhabitants. Their use gradually declined until they ceased production in the middle of the 20th century. The architecture of each of them is similar, all have a round shape, white colour and a pointed roof and very small windows. Such windmills are found in almost all Cyclades islands. One of these windmills has been transformed into a museum. The whole village of Chora and part of the harbour are visible from this point. We offer pick up from the customers hotel in a range of 3 klm of Mykonos Center.